I am 25 and I finally learned how to make the perfect omelette, thanks to watching my sister-in-law make her over easy eggs. She put a lid on it! Whaaa?!? I had no idea it could be so easy, for the past 10 years I've been working way to hard on my eggs with all the watching and the flipping. But now I know the secret to the perfect omelette! I also want to share with you what I use to grate my cheese because it's amazing! My husband bought it at Ikea for less than $10 and it makes grating cheese a breeze. 1. Scramble your eggs with a bit of water, I used 4 eggs in a medium frying pan. 2. Add your eggs to the pan and put the lid on. 3. While the eggs are cooking, I like to add all the ingredients I am putting into my omelette into a 2nd pan to heat and melt with cheese. 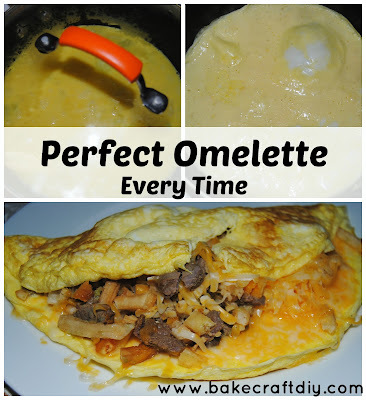 You can add the ingredients directly into the omelette while it's in the pan but I find it is too hard to plate it in one piece. 4. When the eggs finish cooking plate the omelette and add the heated ingredients before flipping it closed.